This is another beautiful silver and plaque a jour piece made by Jean Wilkinson. 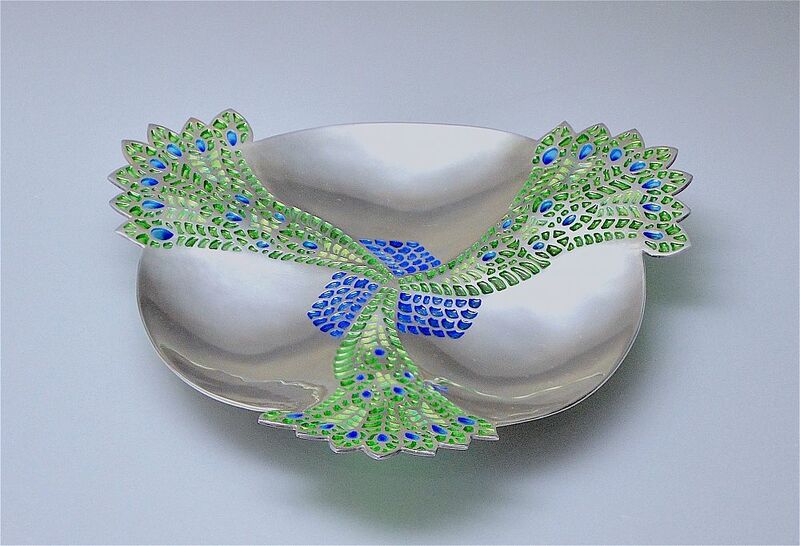 The dish is know as "Peacock" and it is divided into 3 sections by 3 plique a jour peacock' s tails of cobalt blue, peridot & mint green. Between each peacock's tail is a panel of bright blue plique a jour. Each silver section is lightly plenished and gently concave. The dish is supported by 3 silver spherical feet. the base is hallmarked by the London Assay Office for silver, 2008 and bears the sponsor's mark "JW" for Jean Wilkinson. Best displayed on a stand so that the light illuminates the plique a jour.